I mean, look at that gorgeous (!) label shot! Woo hoo — this beauty appeared in an article by Food & Wine that went live today and recommended Fournier Sauvignon. 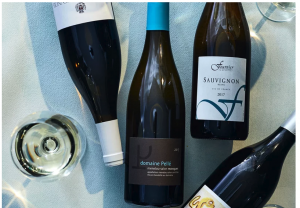 The writer makes a fabulous point that with Sancerre’s rapidly increasing popularity — and price point — sometimes, a Sauvignon produced in the same region by the same vineyard can come as a delightful surprise with its lower cost yet still delicious, refreshing taste. Case in point: Light, crisp, delicious Fournier Sauvignon. “It’s a killer deal, full of zesty gooseberry and light herbal flavors,” says Writer Ray Isle of Fournier Sauvignon, who is Executive Wine Editor of the esteemed foodie magazine and a native Texan like our newest team member Jenny Davis Mueninghof, who joined DMS Wines February 1st as National Key Accounts Director. If you’ll recall, Fournier Sauvignon was also recently recommended as an excellent wine to serve at weddings, on PureWow.com. Fournier is a top producer and that they offer this delicious, crisp white at a more approachable price tag is their little secret. But not for long now that the wine writers are on to it ; ) Sounds to us like it’s time to stock up! Email Orders to AlexDMSelects@outlook.com. Request samples at Admin@DMSWine.com. Cheers! ← Our TEXSOM 2019 Awards!